Communication technology: we won’t dwell on this but we see the same progression. Here’s that graph of the Internet. I had a little piece about this in the 1980’s when it was the ARPANET, I predicted that it will be a worldwide phenomena. This is the same graph on a linear scale. To the casual observer it looks like the Internet just came out of nowhere in the mid 1990’s. The first reference to the World Wide Web in the New York Times was in 1993, December of ’93. But you could see it coming if you look at the exponential progression, which you can see on a logarithmic graph. We’re shrinking technology at a predictable rate. That’s obvious in electronics, that’s the whole force behind Moore’s Law. It’s also true of mechanical systems: it’s a factor of 100 per 3D volume per decade. 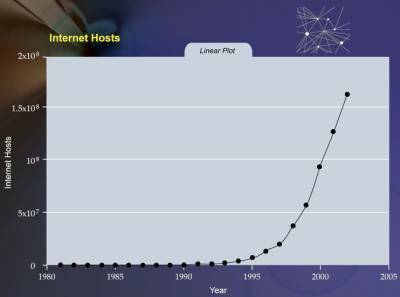 A doubling every year is multiplying by 1000 in ten years of price performance, capacity and bandwidth of information technology. That’s a billion in thirty years, and there’s also a slow second level of exponential growth, so it’s really 25 years. 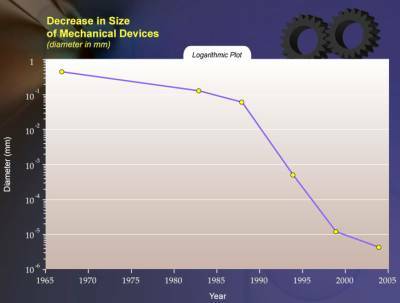 In 25 years we’ll also be shrinking the size of electronic and mechanical technologies by a factor of 100,000. So, if you look at the impressive things we can do today and factor in this billion fold increase in capacity and one hundred-thousand fold decrease in size, it gives some idea about what will be feasible. These illustrations, which have now been simulated, which are in Eric Drexler’s  book, “Engine’s of Creation” of 20 years ago (which founded nanotechnology ) are now being built. I give several dozen examples in my book of molecular systems, in particular those being used in biology. For example, one scientist actually cured Type 1 diabetes in rats with a blood cell sized device. It’s quite intricate. It lets insulin out in a controlled fashion. It blocks antibodies and can stop Type 1 diabetes as an autoimmune disorder. It works, and they’re gearing up for human trials. At MIT and at the University of Rochester they have a little device that’s blood cell sized that can detect antigens, specifically cancer cells. Once it detects them it latches onto the cell, burrows inside the cells, detects it’s inside the cells, and releases toxins. So, it’s a fairly elaborate procedure. It works quite reliably in-vitro and they’re now gearing up for animal trials. So, this is what’s feasible today. There are four major conferences on this kind of stuff, bio-MEMS. People say ‘nanobot’ sounds very futuristic, but blood cell sized devices can actually do things inside the human body. They’re not putting it in the human body yet, although we have pea size devices and bb sized devices we are putting in the human body, but we are putting them in animals and they’re performing therapeutic functions today. If you apply the billion-fold increase I’ve spoken about, then very sophisticated nanobots will be feasible in the decades ahead. 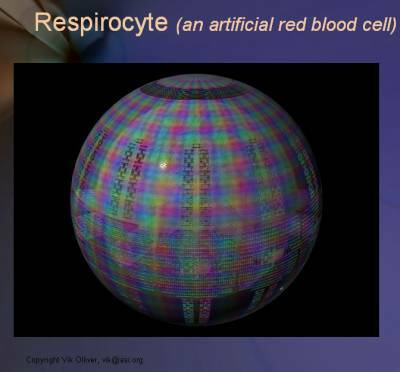 This is a robotic red blood cell that was designed by Robert Freitas , and we do understand how red blood cells work. It brings up an interesting observation about biology. It’s very intricate but it’s also very suboptimal in terms of its capability, because biology got stuck with some earlier substance like building everything out of proteins, which are interesting substances but a limited class of materials. We find out we can re-engineer these systems to be far more powerful. If you replace ten percent of your red blood cells with these respirocytes, you can do an Olympic sprint for 15 minutes without taking a breath, or sit at the bottom of your pool for four hours. And a very dramatic example is in fact the brain, which transmits information through signals that are electrochemical and travel at a few hundred feet per second. That’s a million times slower than electronics. For another example, the computation that takes place in the interneuronal connections such as dendrites are computed at 200 calculations per second. They’re not exactly calculations, they’re digitally controlled analog transactions, but there are about 200 of them typically, as the reset time is about five to ten milliseconds. That’s a million times slower than electronics. Ultimately we can reengineer these things to become far more powerful. If we follow this doubly exponential progression, $1,000 of computation will equal ten to the fourteen calculations per second, which I maintain is enough to do functional emulation-simulation of all regions of the brain- for $1,000. You don’t even have to believe in three dimensional molecular computing, although there are relatively few people who are knowledgeable and express skepticism about that anymore because they’re now working in labs. But even if you are skeptical, two dimensional conventional photolithograph  chips on the ITRS  roadmap by around 2018 or 2019 will provide this level of computation for $1,000. 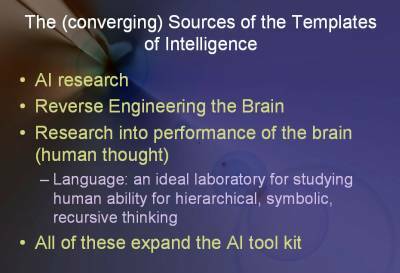 I pose reverse engineering the brain as more of an existence proof, that we’ll ultimately understand the principles of the operation of the human brain. I agree with Ben Goertzel  that we can achieve human level AI even if we never looked at the brain at all. Largely that’s been the case in AI (Artificial Intelligence) because up until recently we couldn’t see in the brain, other than with these fuzzy fMRI  images, which aren’t sufficient to reverse engineer anything. That’s changing. I talk about five or six emerging scanning technologies where we can see, in-vivo individual interneural connections, see them firing in real time and begin to develop models of how a real brain works, combining them with models of individual neurons that can be tested in-vitro. We’re building very sophisticated model and simulations of the brain like the IBM Project on the cerebral cortex. I make the case, although I don’t have time to go into details, in chapter 4 of the book, that at the progress we’re making (and you can measure certain aspects of this, like the spatial resolution of brain scanning, the amount of data, the number of simulations we’re doing of specific regions) it’s really conservative to say within 20 years we’ll have detailed models and simulations of the different regions of the brain. I do think that human level intelligence will come from AI research as it has, which is just trying to emulate human levels of intelligence. I believe narrow AI is getting less narrow, and combining multiple methodologies, and that will continue through hundreds of steps until it’s as broad as human intelligence, which is not completely general either. has been the basis for numerous journal articles and for books including Engines ofCreation: The Coming Era of Nanotechnology (written for a general audience) andNanosystems: Molecular Machinery, Manufacturing, and Computation (a quantitative, physics-based analysis). He helped lead development of the 2007 Technology Roadmapfor Productive Nanosystems, a project managed by Battelle and hosted by several of the U.S. National Laboratories. 100 nanometers, and the fabrication of devices within that size range. 3. Robert A. Freitas Jr., J.D. - published the first detailed technical design study of a medical nanorobot ever published in a peer-reviewed mainstream biomedical journal and is the author of Nanomedicine, the first book-length technical discussion of the medical applications of nanotechnology and medical nanorobotics. 4. Photolithography (also optical lithography) is a process used in microfabrication to selectively remove parts of a thin film (or the bulk of a substrate). It uses light to transfer a geometric pattern from a photomask to a light-sensitive chemical (photoresist, or simply "resist") on the substrate. A series of chemical treatments then engraves the exposure pattern into the material underneath the photoresist. In a complex integrated circuit (for example, modern CMOS), a wafer will go through the photolithographic cycle up to 50 times. 5. ITRS - the fifteen-year assessment of the semiconductor industry’s future technology requirements. These future needs drive present-day strategies for world-wide research and development among manufacturers’ research facilities, universities, and national labs. 6. Ben Goertzel - 20+ yrs in AI R&D and commercialization. Former CTO of 120+ employee, thinking machine company, Webmind. PhD in mathematics from Temple University. Held several university positions in mathematics, computer science, and psychology, in the US, New Zealand and Australia. Author of 70+ research papers, journalistic articles and 8 scholarly books dealing with topics in cognitive sciences and futurism. Principle architect of the Novamente Cognition Engine. 7. fMRI - Functional magnetic resonance imaging is the use of MRI to measure the haemodynamic response related to neural activity in the brain or spinal cord of humans or other animals. It is one of the most recently developed forms of neuroimaging.